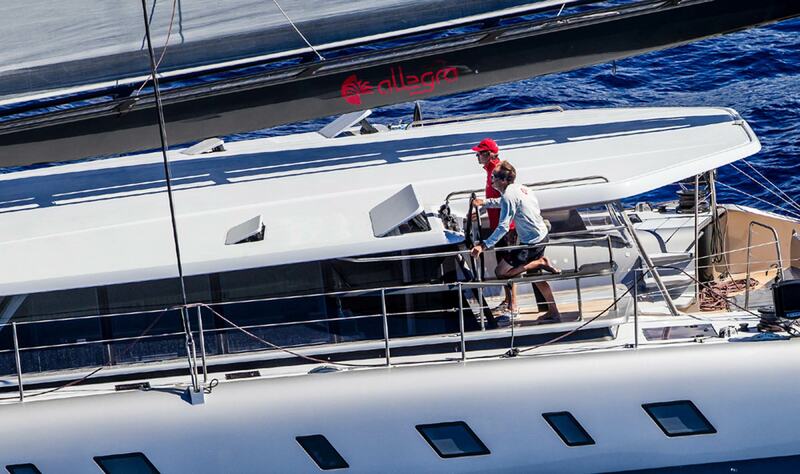 Two years ago we had the pleasure of joining Allegra for her maiden offshore voyage from Southampton down to Palma. It was a great trip to get acquainted with her, albeit a trip aimed at testing all of her systems in the real world. Very quickly she showed both sides of her design attributes of speed and comfort when we hit over 29 knots, fully laden, across the Bay of Biscay as the designer slept comfortably on a sunlit couch in the spacious main saloon, totally unawares. 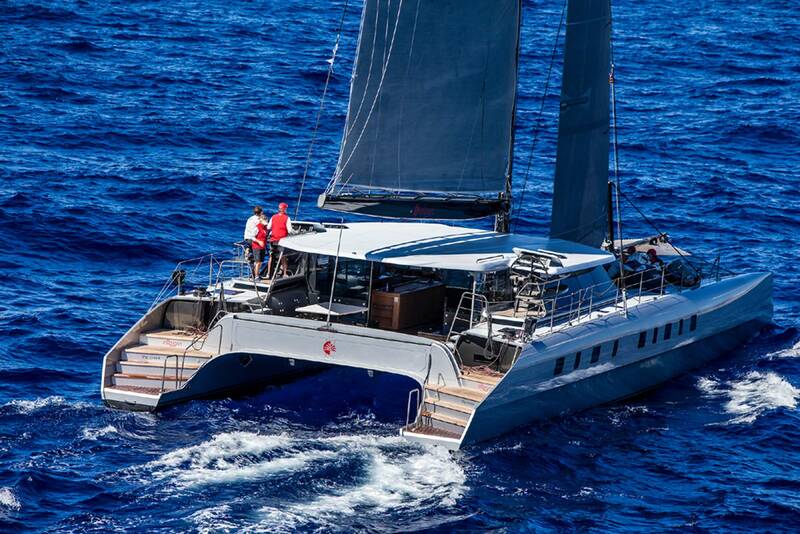 Now it was time to see how the compromise between speed and comfort would go around the race course as Allegra was entered in the 2016 Multihull Cup. 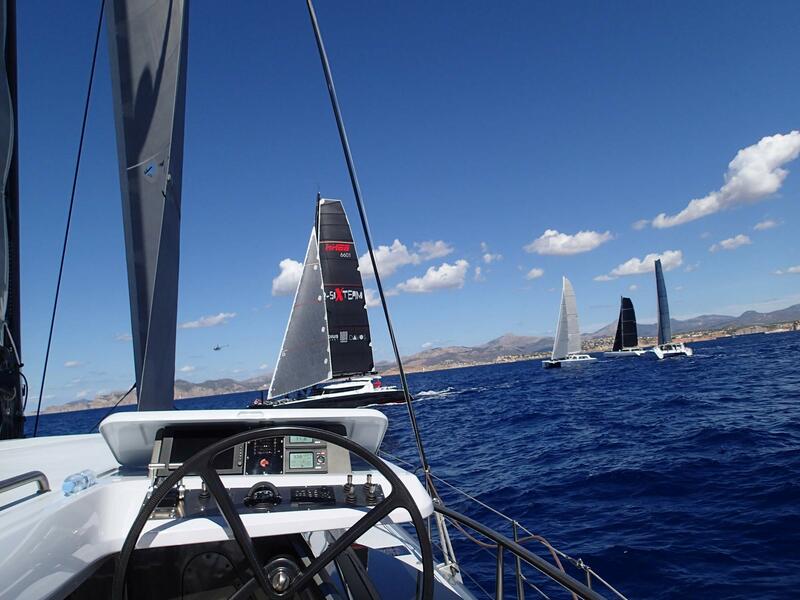 It was a three day event hosted by Port Adriano in the South Western corner of Mallorca. 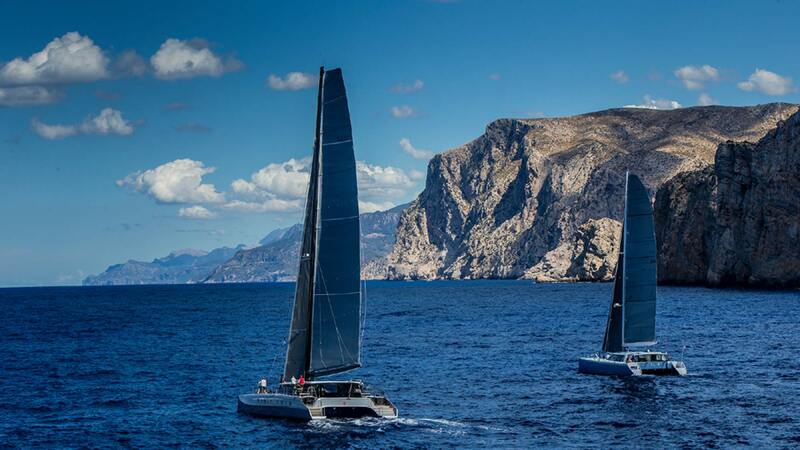 The event is aimed at 50’ plus performance cruising multihulls. The concept for the event is to focus on the design compromises rather than just to strip these boats bare, turbocharge the daylights out of them and try to turn them into something they are not! A unique handicap system is being devised which doesn’t aim to reward the aforementioned approach. These boats are designed to carry their comforts very well under sail and a race course remains the best test of all to compare how well each design fares. Six high quality craft turned up for this inaugural event. Although all were keen to race, it appeared all were staying in the spirit of the event with respect to the weight saving regime. Some of the boats were simply designed with less comfort or amenities but then this should be reflected in the handicap. The crew had been assembled on the Monday and the first job was to “dress” Allegra with some new sails before we could go for some testing and practice. 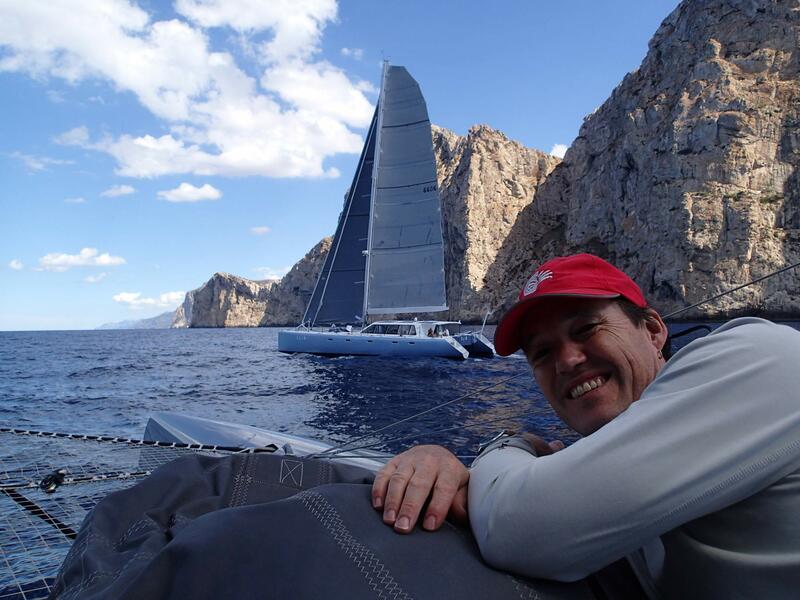 Quinny from Doyle sails Palma, had made a new furling Solent with hanks and foldable batten technology from C-techNZ . We also had a new 5oz A3 on a top-down furling cable for heavier downwind sailing and the old mainsail have been washed so the usual task of putting battens and cars back on had to be done. 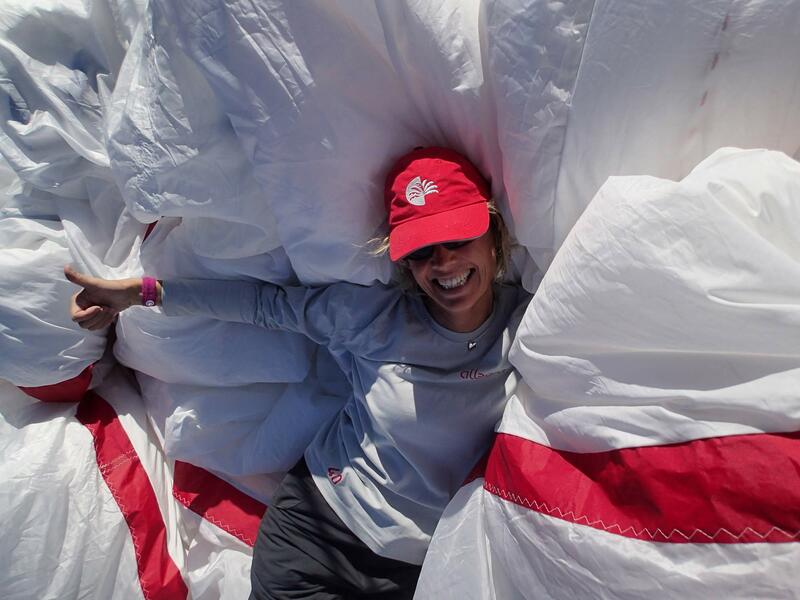 The rest of the wardrobe consists of an A2 equipped with an inflatable snuffer also from C-tech NZ, a North sails 3di screecher on its cable and furler, and the usual headsails J3, J2 and a staysail. The J2 is a Doyle sail made from their latest cloth called ICE and the J3 is a North 3di. My role for this regatta would be as navigator. Allegra is equipped with the cruising/racing navigation software Expedition. I am pretty familiar with this software since I have used it all last year racing on the mighty Paradox (also a Nigel Irens design) a 63′ trimaran in which we won the RORC Transatlantic, Fastnet, and Middle sea races in our class. This would be Allegra’s first ever racing since she was built, there has been no need to use Expedition software for cruising and deliveries so the program needed some set up for racing. This takes some time, with plenty of ‘tick box’ settings to run through. Allegra has not really needed to sail to polars up until now so we loaded the VPP numbers and we would start logging ‘real’ racing numbers as we went. These ‘real’ numbers are always hard to get. The data we record will become very useful for our future goals in racing Allegra in the ARC, starting in a month or so from Las Palmas. After Monday prepping the boat, we went out on Tuesday for a test sail. There was not much wind but that was fine since we needed to hoist the main and fit the cars on to the sail. We rolled out the solent and did a few tacks. With the focus now on racing we were now looking to use the full range and speeds on offer for all the systems. 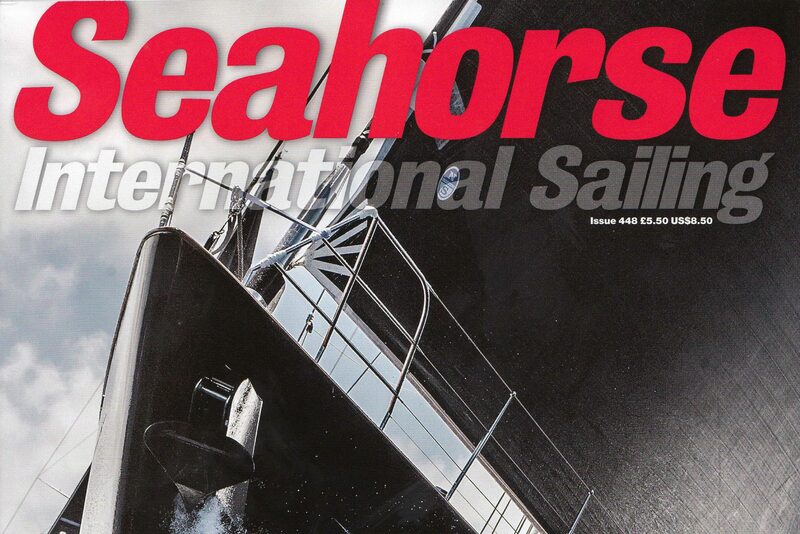 This quickly finds any weaknesses and is one reason why racing a boat can help make for a more sorted cruising boat. 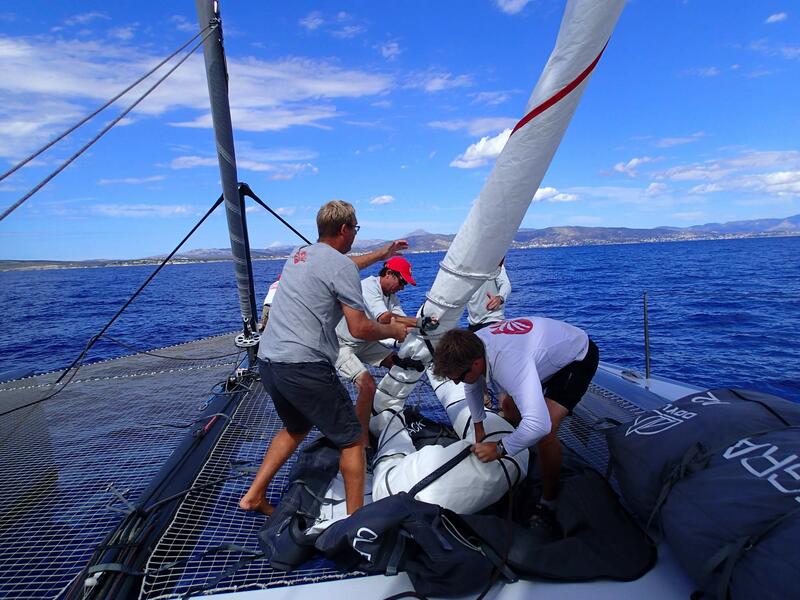 Using max mast rotation found a hydraulic issue that cut short our session but was swiftly sorted once ashore. Thursday afternoon we sailed again and went through the whole sail wardrobe to familiarise ourselves with hoisting, sheeting and dropping procedures and working as a team. 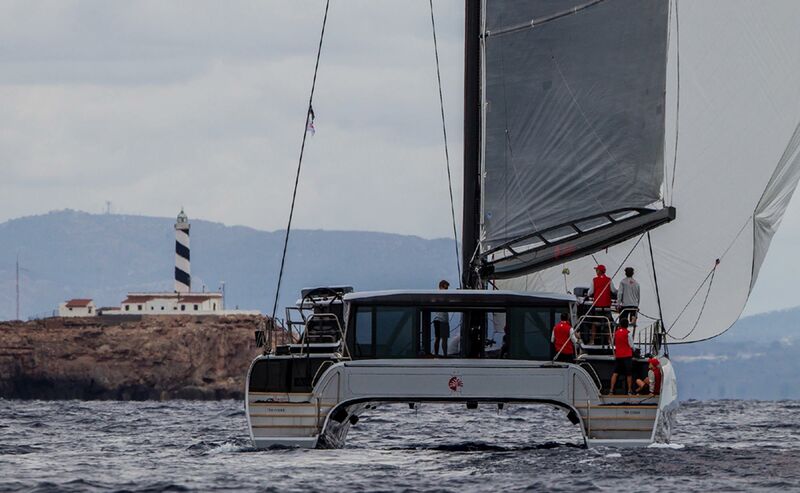 The course start area was held in close proximity to the Island of El Toro, leave Dragonera Island to starboard and back to the finish. The wind was WNW 10-12 knots and forecast to veer around to the North with a leftover sloppy sea state. This sea state made for difficult driving and maintaining momentum was the key. Allegra started on port tack into a 10nm beat, Coco de Mer and Dragon came with us in to the bay whilst Slim, R-six and Outnumbered tacked out to sea searching for more wind. 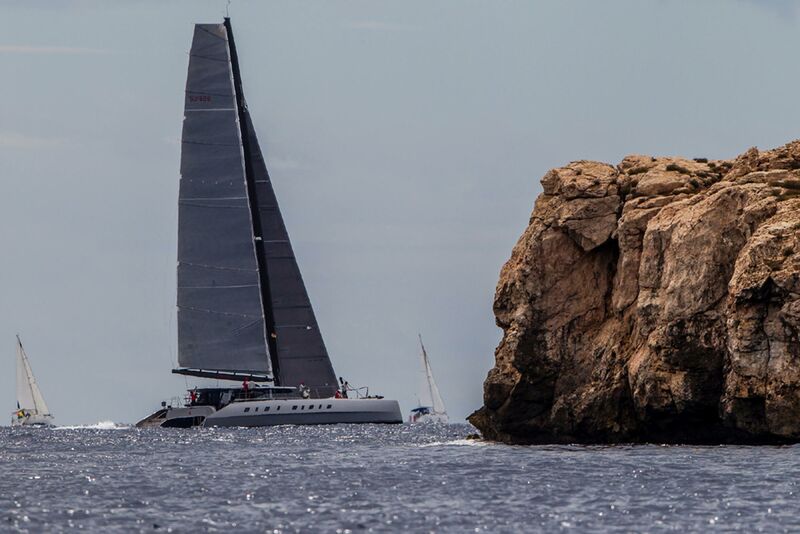 A close battle upwind to the bottom end of Dragonera followed. Our mast rotation problem appeared again which cost us dearly upwind until it was resolved and the mast set in the middle for the rest of the race. Meanwhile we fought on neck and neck with Slim, scraping along the tall vertical cliffs in the stalled wind at their base. We were set up for the screecher and were hoping to set it here but the wind had already veered North so now there was a 2.3nm one tack beat to the top of the island. We bore away and set the screecher at the top. Lola, the ships dog on Slim barked in disgust as we began to roll over Slim once more. The gap between the islands was tiny and nearly missed at the helm. Once spotted i.e. “oh wow…that’s it there”, we swiftly peeled to the big A2. Now we were in the lead again and gybing downwind back home towards the finish. Some choppy waves on starboard gybe made things difficult for the helm with the light A2 pumping hard so we discussed peeling to A3 but once we gybed on to port again things began to glide more smoothly. Our problem was that we were riding on the slow moving front of the new breeze whilst those behind closed in. A fumble at the finish forced us to douse the kite early and harden up to cross the line. This race was judged as a light race so after the rating calculations we were in 3rd place. It was a tricky first race for all on board and as was obvious from the bar chat afterwards, the rest of the fleet as well. Everyone felt they had a messy race getting to grips with the conditions, their boat systems and the crew work. This would probably turn into a competition of who could learn and improve the quickest. Start area off El Toro, race buoy of La Mola point, a spreader down wind mark further out to sea and round Illot de Sec, leaving it to port and back to the finish. Wind was NW gusting 18 knots. 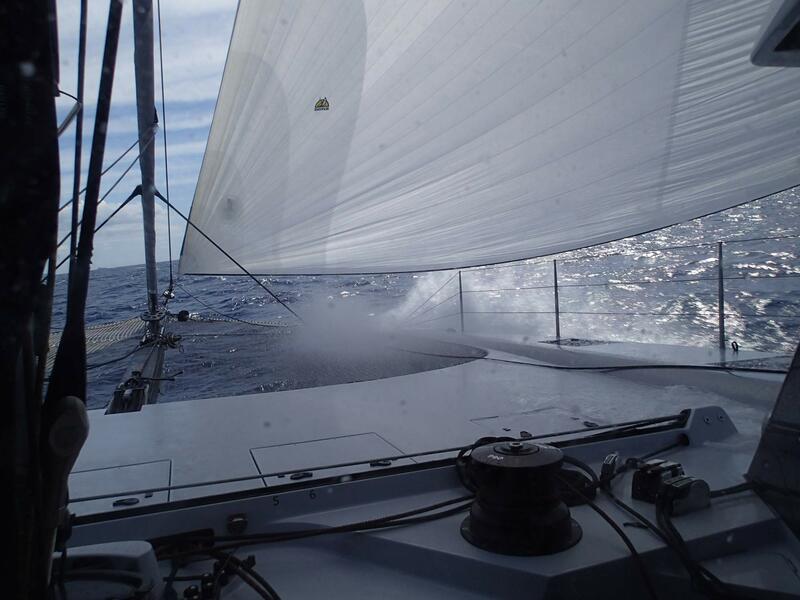 Great start at the pin end, we thought we were well clear and the crew settled in for a 6-7nm beat – Allegra over! We had to turn around and restart. This manoeuvre cost us about 6 minutes – we will deal with that one later. Half way up the beat Dragon had a main halyard failure, they called the race committee after 10 mintes and retired, we found out afterwards that it was a broken lashing. We regained composure and began hunting the fleet down. The breeze was building and being the biggest boat here, these conditions suited us nicely. By holding the bow down we could build speed up over 15 knots. The daggerboards would be working nicely and the hydraulic mainsheet would be tweaked in. Allegra heels nicely and sort of rolls onto one hull rather than “pops”. The transition was very smooth. It was a new experience for her owner to get acquainted with but it was obviously very fast. Every time she was leaned on we would take a big chunk out of the other boats. By the top of the course we had managed to catch and overtake the rest of the fleet and rounded in 1st place. The start was forgotten as we deployed the strong A3 and took off for the sleigh ride down wind. The port gybe was sweet and surfy as 30 tonnes of carbon comfort threw a fountain up off her raked bows and took off smoothly down the waves. Whilst we gave her a good nudge at times, we could have pushed her much harder but the game here was familiarisation. As far as Allegra’s racing career goes, these are early days for us all. Allegra was sailing at a TWA of 145° touching speeds well into the 20’s. It was pretty much champagne sailing all the way down to the spreader mark. Rounding the bottom mark we had to come up to a TWA of 75°- 80° and I had seen the wind gusting to 27 knots. We unfurled the solent. This turned out to be the wrong call since we got a wind shift and the wind was dropping, we now needed the screecher for this leg. The foredeck crew did a nice peel and now we had the right sail heading towards the light house. The wind got even lighter in towards the bay and up around the small Island of Ille de Sec. We furled the screecher and sailed through the gap under solent. As it now was very light and downwind we hoisted the A2. Rounding the lighthouse and we were back under solent with a short beat to the finish line. Annoyingly, those who came around the point behind us climbed well inside us on a different breeze and made the finish in one tack whilst we required a few. We finished in 1st place, but after correction on handicap we were still in 3rd. I don’t think the 6 minutes lost at the start would have won us the handicap in the end… but it sure would have made it closer. There were other places we could have made easy gains but once again… I bet all boats thought similar. We were all very happy with how well the boat had behaved and how she treated us to a great day’s sailing. With the start area moved just to the west of the harbor we had a short, 1nm, beat to lat. long. buoy. Around the light house leave Illot de Sec to port and back to the finish line. Around 15nm for the course. We motored out onto a flat and windless course not expecting much of the day but almost on cue the wind filled in. It was light at first but built enough to make a race worthwhile. As we were getting in to the start sequence the wind built to 11-12kn. We rounded the top mark in 2nd place to R-six who came in from the other side of the course. We hoisted the A2. In this lighter wind the fleet was closer together. There were a few holes in the wind that made it more interesting as some were slowing whilst others were accelerating. We struggled to sail through the lee of R6 and so gybed back in towards the shore to clear our air and sail to our own polars. We jibed well on the shifts and made some solid gains. Based on the previous days experience around this point we chose to stand off a little more and also chose our sails and “peels” between them a little more carefully. 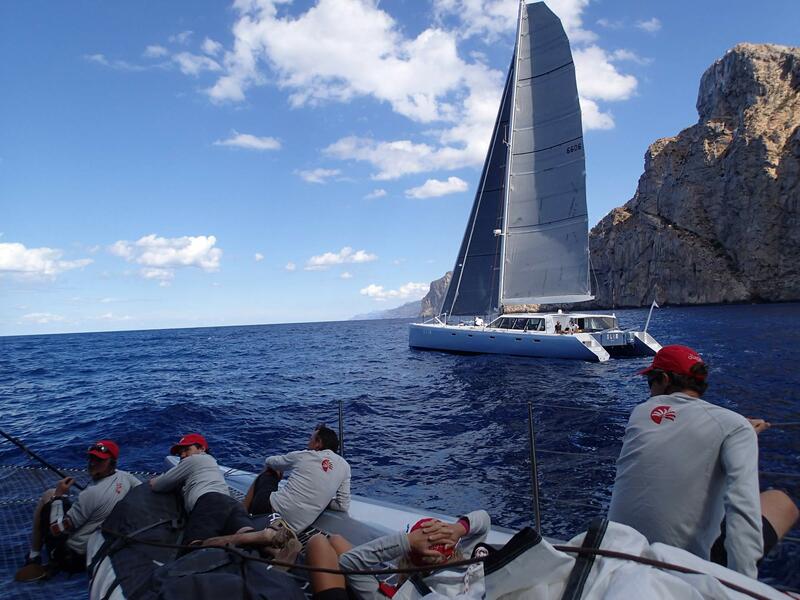 We held the A2 for as long as we could and came up on course towards Illot de Sec with the screecher. We peeled once more to the solent for the short beat and tack around the tiny rock island and then peeled back again to the screecher for the reach to the lighthouse. The four boats behind us were having a right old ding dong battle and we hoped they would trip each other up. It wasn’t to be as R-Six seemed to get clear of the pack. The beat back to the finish was painful. Once again we just couldn’t get into sync with the shifting winds around the point. Two of the tacks cost us dearly and R-Six ate into our lead. We tried to get to the right of them but they covered that side of the course well. As the wind moved right, our lead shrank further. It was obvious they were sailing better. 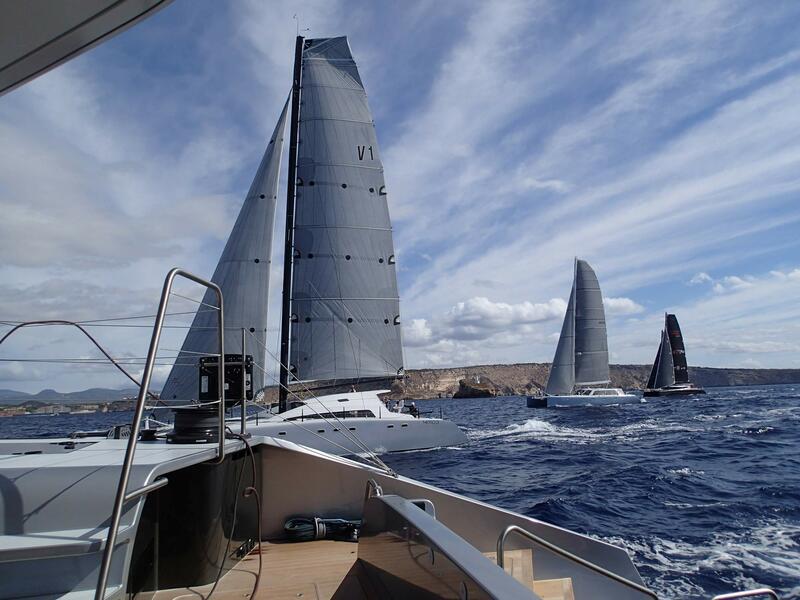 We watched R-six eat our lead away and pipped us to the finish line by a few boat lengths. It wasn’t the way we wanted to finish and doubly annoying as we had otherwise sailed a very clean race… perhaps our best. We finished second arond the course and fouth overall for the regatta. This was the first time these boats had lined up together and for some (including us) the first time we had raced at all. It would be hard to judge the boats purely on these results. The handicap system is very much being tested along with the craft and has been put “out there” for open discussion. Whilst there were many people onboard representing the various design offices, builders and sailmakers all keen to claim bragging rights, it must be remembered that in the end this is about the owners and the balance they want to strike. The racing aspect should compliment the overall package without dominating it. Racing does improve the breed though and it was plain for all to see how rapidly all the boats and crews improved over the three days. It will be interesting to see how well the rating system develops and how well the competitive nature of all involved can be harnessed. With some of the owners smiles beaming around the pool at the prize-giving paying testimony… it’s off to a good start. 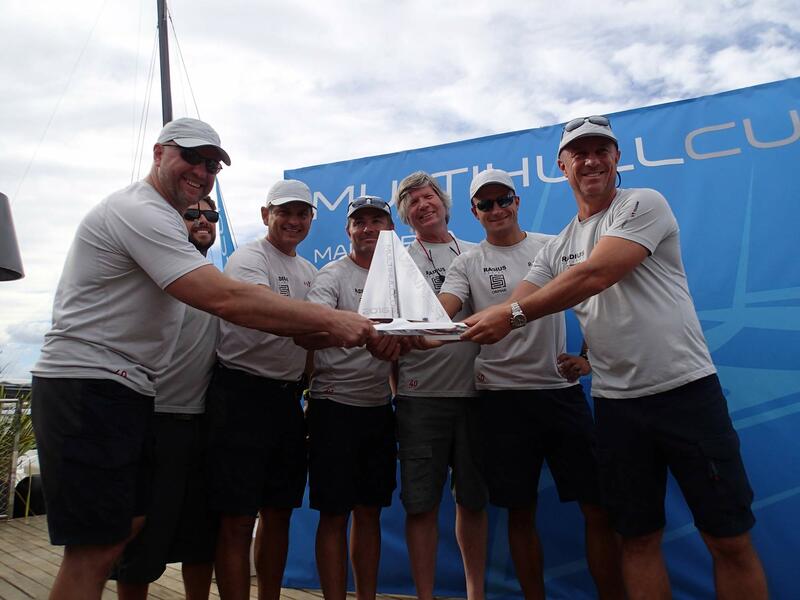 For Multihull Cup 2016 results click here.